Ivanna is a professional sophisticated Oriental Dance Artist (the correct terminology for belly dancer) who possesses an excellent spirit for engaging any crowd in a friendly, clean and family-oriented environment! Make your event one to remember with an unforgettable dance performance by Amazing Ivanna! A highly skilled and experienced dancer, Ivanna will delight your guests with the elegance, excitement, and beauty of Oriental Dance. Ivanna is one of the most famous bellydancer in NY/NJ worshiped for all her audience,and top choice for a lot of venues in NY/NJ and Chicago area. Her talented is unique. Ivanna guarantee an excellent show. She offers different styles such as Show Belly dance, performance with a live band, Bollywood ,Iraqi, Egyptian, Lebanese, Turkish ,Samba, Fire . She has performed at scores of venues, variety of festivals ,competitions, stage performance. She has opened concerts for Bollywood and Spanish celebrities. Don't miss the opportunity to hire the best for you event!! At the age of five she started folk dancing in Ukraine, she travelled to different regions and finished choreography studio by the age of 12. At age of sixteen, Ivanna started learning belly dancing. Now, with over ten years experience in belly dancing. She has visited and learned state of art techniques at different workshops from world famous belly dancers across the world. She is a favorite fixture on the local dance scene. Ivanna features props in her style including veils, swords, candles, fans, fan veils, Isis Wings, cane, and finger cymbals. She is known for her energetic, sensual, and emotionally expressive performances. Her teaching style is accessible as she fills her classes with her sense of humor and easy to follow breakdown of even the most complicated techniques and concepts. A highly skilled and experienced dancer, Ivanna will delight your guests with the elegance, excitement, and beauty of Oriental Dance. Ivanna is one of the best belly dancer in New York and New Jersey worshiped for all her audience,and top choice for a lot of venues in New York and New Jersey and Chicago area. Her talented is unique. Amazing Ivanna guarantee an excellent show. 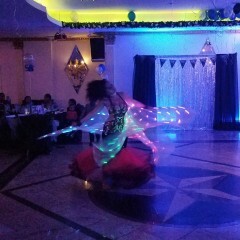 She offers different styles such as Show Belly Dance, Bollywood ,Iraqi, Egyptian, Lebanese,Turkish, Fire Show, Live Band. 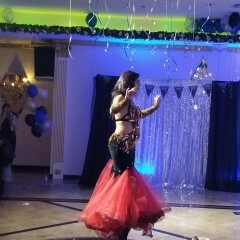 In the Middle East it is often said, " A party doesn't start till the Belly Dancers arrive." Make your special occasion one to be remembered and talked about for years to come! Ivanna will be happy to perform at your event. A full show ranging from 20-25 minutes. Choreographed and performed in lavishly beautiful costumes. Show will include Veils/Wings, Sword/Candles and Drum solo. Great for any special event. Audience participation will be included (if require). She also performs with Veil, Double Veil, Cane, Sword, Fire sword, double swords, Isis Wings, Butterfly Wings, Shamadan, Candelabra, Candle Tray Dance, Fire Fans, Zills, Fan Veils, Led light/wings, Tabla drum, Palm torches, feather fans and much more.Dancing with the fire is available for your choice.The Dancing Fire creates a special performance for your Wedding, Reception,anniversary,birthday celebration or any kind of event. Ivanna can provide an authentic Middle Easter experience. She specialized on different styles of dance such as classical Egyptian choreography Raqs Sharki, Khaligy, Saidi ,Iraqi, Labanese Dabke, Comedy,Turkish Tsifteteli, Turkish Cabaret Style, Ghavazee,floor work, Vintage belly Dance, Gypsy, Andalusian (Spanish fusion), Zeffa (Egyptian wedding dance), Bollywood, Modern Belly Dance. Her Packages feature an array of props, music selection, costume color selection, and full customization. She dances at prestigious events and venues throughout New York and New Jersey and Chicago. Hiring a middle eastern band or a tabla player is also available for your full experience. Ivanna has experience over 15 years and trained under famous dancers known worldwide. Also she is a belly dance teacher and instructor. Let her be the highlight of your event and make your guests exited ! Please feel free to contact us. Ivanna was absolutely wonderful and did everything to make my Mom's birthday extra special! She is very professional and easy to communicate with and get in touch with regarding all details of her performance. Again Ivanna - a thousand thanks!!!!!! Ivanna was great. It was my fault the dj couldn't get her music right. But it played and and she was great. Very friendly and a beautiful dancer..i would definitely recommend her..
Special offers, group and duo show performance is available. Contact us for more details. Here are the answer to some of the most frequently asked questions about hiring a belly dancer for your event. Q. How long is the show? A. Typically 25-40 minutes. The dancer will start off with a performance involving veil, sword or finger cymbals. This will be followed by getting the audience involved in dancing. If there is someone special being honored, let the dancer know and she’ll be sure to include him/her! Q. Is the show appropriate for children? A. Absolutely! Children love to dance and are often some of the most enthusiastic and entertaining participants of the audience participation portion of the show. Q. How far in advance should I book a bellydancer? A. Sooner rather than later. If you are flexible on days and time, a last minute show can often be accomodated. Saturday evenings during holidays and wedding season tend to book early. Q. What kind of music is used? A. Depending on your preference, music can range from classical Arabic to modern pop. I have a varied music collection including everything from contemporary Turkish to Persian favorites. Q. Who provides the music? A. The dancer will provide the music and the venue should provide the sound system (typically louder is better). Please let the dancer know whether you prefer the music on CD or iPod. If you do not have a sound system available, please let me know in advance and I can coordinate to bring one. Live Persian,Turkish or Arabic musicians can be arranged upon request. A. Yes. Unless the host has indicated otherwise, tips are appropriate and appreciated. Tips may be thrown over her head in a “money shower ” or giving in the hands. Q. What kind of payment is accepted? A. Deposit should be made pair to the show via Pay Pal or other method. The rest of the Payment is due immediately after the show in for the form of cash (preferred) or personal check. Q. What if I need more than one bellydancer? A. Ask about booking Ivanna's Larger groups of bellydancers can also be arranged. Copyright © 2018 Amazingivanna Belly Dancer - All Rights Reserved.